The Ranchalow is a 1966, 1250 sf 3 bedroom - 1 bath ranch and bungalow style home I purchased in December of 2017. When I moved in, I knew I didn’t need 2 extra bedrooms. 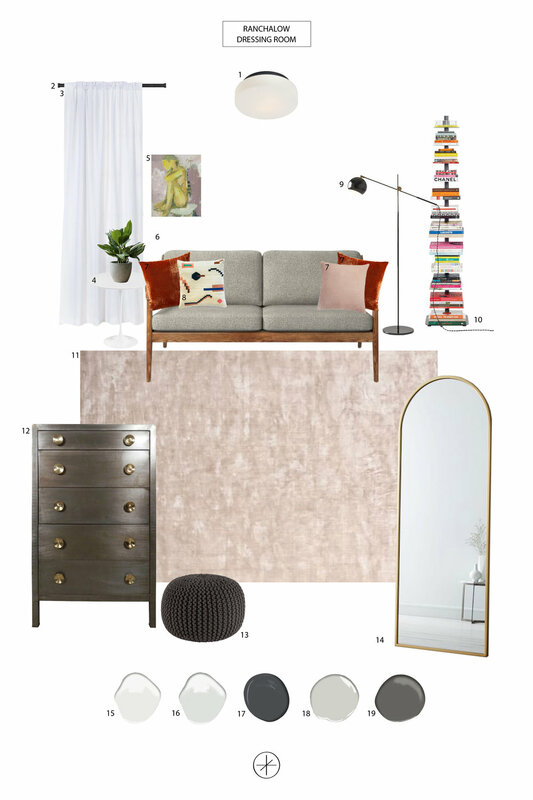 Nor did I have furniture for three bedrooms so I decided to turn the smallest office/nursery/bedroom into my own personal walk in dressing room. Because let’s be real, I have a studio and my home office is the dining room table or couch, just don’t tell the IRS. Having this room has changed my morning routine, for the better. Everything is in it’s place and easy to access for once. And it’s not a huge amount of work to make for yourself, you just need a spare room. 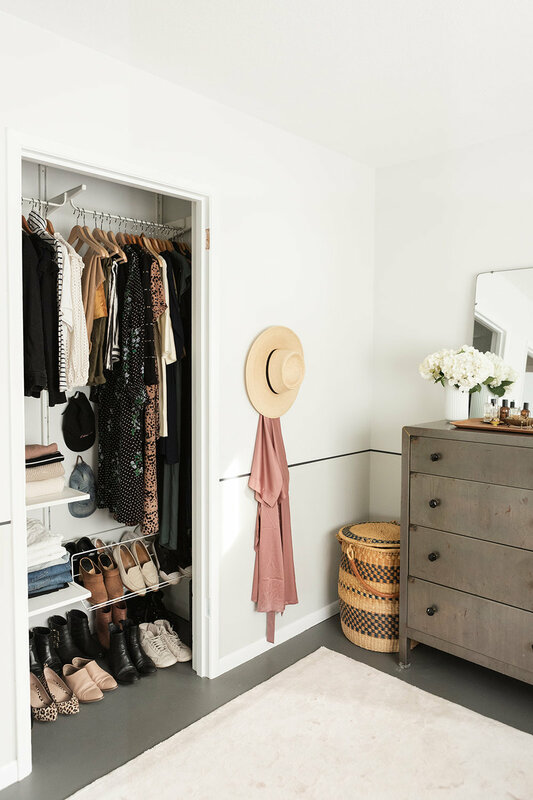 Below, I’m sharing the things that made the biggest impact and ways you could create your own personal dressing room! The remodel started with a fresh coat of paint, including the floor. I ripped out the brown carpet (scroll down to the last few photos to see before) and as a lower cost way to finish out the room, I painted the sub floor with 2 coats of INS-LX Aqua Lock Primer and Benjamin Moore - Kendall Charcoal. 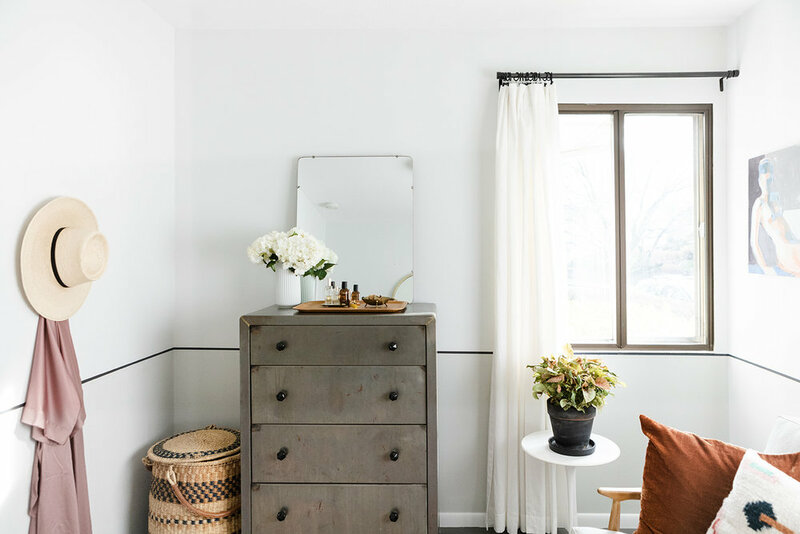 Because the room was the most basic beige and brown box with zero architectural interest, I added a soft gray wainscot divided by a 1/2” thick strip out of thin charcoal paint. I set the line of stripe at the window sill because it felt like the natural break in the room. Step 2. 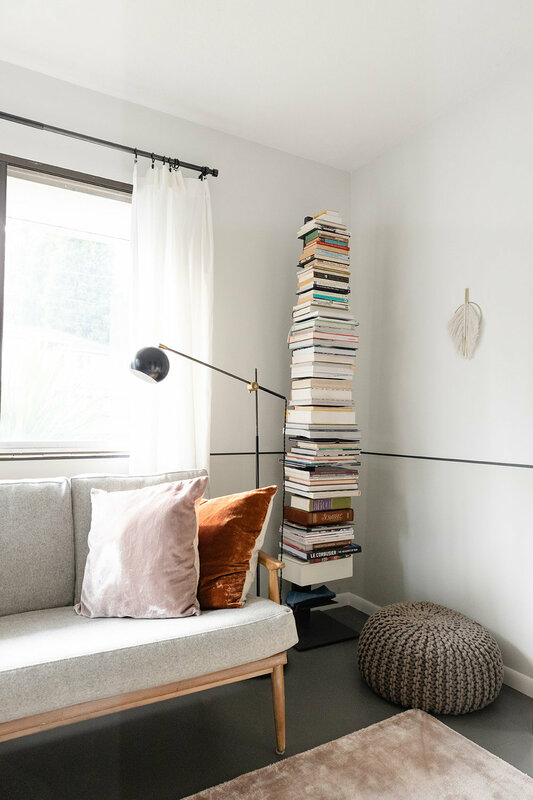 Update your closet shelving system and KonMari everything in it! That alone will change your life! Because the closet in this room is so small, I removed the door and decided to paint the natural wood trim for less visual breaks. The trim is basic and I wanted it to disappear. Not having the door makes the closet that much more accessible too. The downside is, it needs to be organized well because it is so visible. From my experience, closet shelving systems and window coverings are either incredibly basic and cheap or very high end. I did loads of research and finally found a solution that is incredibly easy to install and also inexpensive! I like it so much, I’m planning to use it in the 3 other closets in my home. Enter Ikea Algot closet shelving system. It is a very simple wall support with brackets, shelves, baskets, hanging rods, shoe shelf and drawers. The configurations are unlimited based on your own needs! After closets, window coverings are a forgotten but super important element in a home. 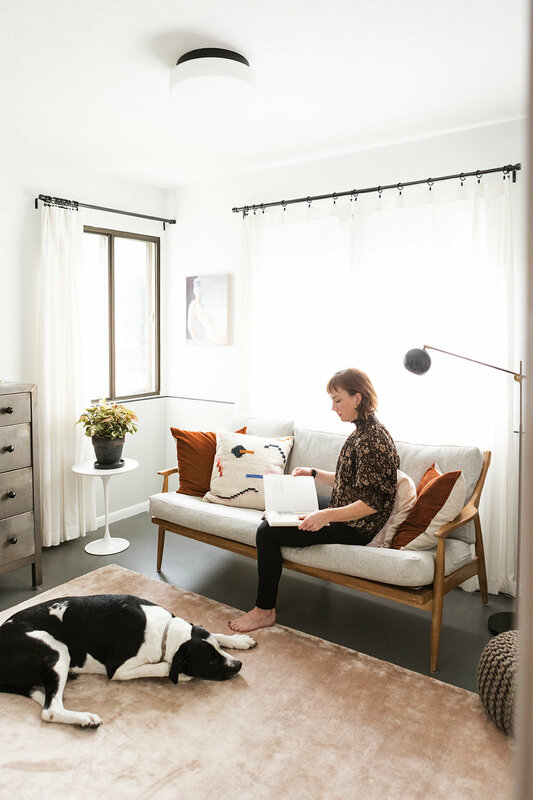 Most people spend so much time finding paint colors, rugs, furniture and lighting by the time they get to closets and window coverings there’s no more money. And window coverings are EXPENSIVE, especially custom ones. Often around $1000+/window. 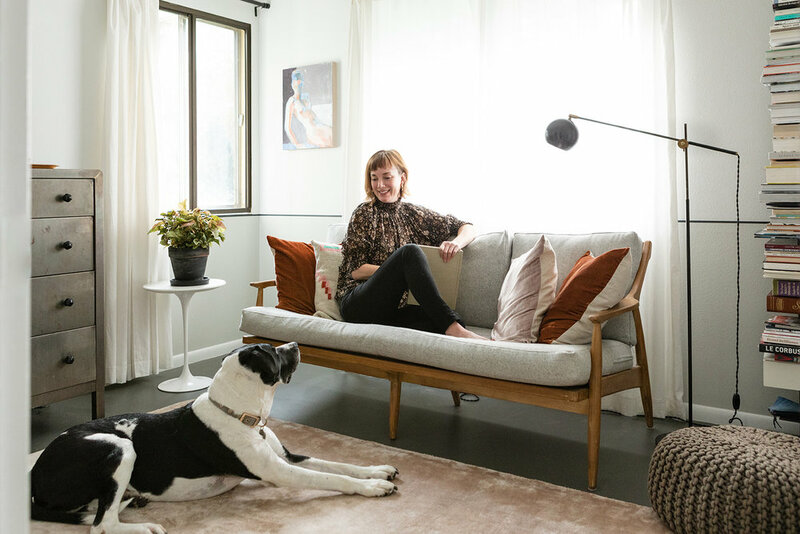 We try to plan for that cost up front in our projects at the beginning but I’ve found a budget solution for windows that is pretty good with an option that is $100/window or $300/window. It’s not custom, it’s not forever and is in very limited sizes so you have to seamstress or be handy with a sewing machine but this is the best looking, least expensive option I have come across in a while. I found the Ivilon line on Amazon with matching rings that I can get in two days. The sizes are varied enough even for really large windows. Then for curtain panels, I have two go-to resources for an inexpensive alternatives. Target and Pottery Barn. The curtains panels that I used in the Dressing Room are the Target Threshold Collection. They are $25/panel and very limited in size and privacy. I also found they are also inconsistent in length by several inches (which can be hemmed but that’s annoying if you don’t sew, it will cost you more than the panel to have them hemmed) but hey, they are $25/panel. You get what you pay for and sometimes you just need a quick window covering. Because the Target Threshold panels are a linen rayon blend, they work if you don’t need a lot of light protection. They also only come in one size. So if your window is really wide or your ceiling is above 8’, don’t use these. To determine if you should use it or not, take the width of your window and multiple times 1.5 then divide by 2. This will give you the ideal panel width and don’t go any smaller in width for each window panel (in most cases you need two panels per window). If you need wider, taller, or blackout, bump up your budget and use Pottery Barn Emery Linen Cotton Panels. 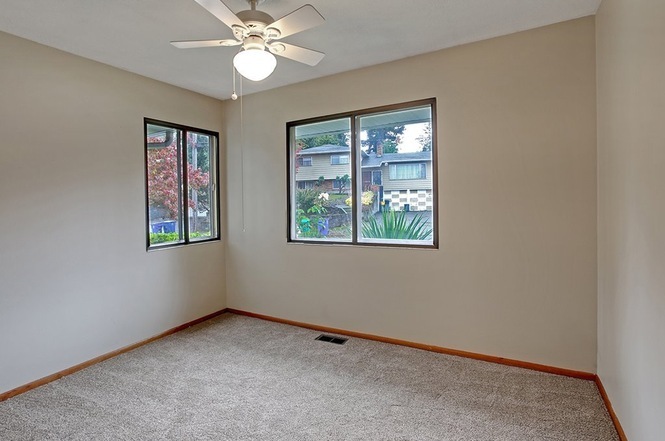 Because when curtains are closed, they should not look like a flat panel. There should be some fullness to have the look of a higher end window. The Pottery Barn panels are well made and lined (you can get blackout) but you’ll spend $260/window for Pottery Barn and $50/window at Target. If you have the money, Pottery Barn is completely worth it. Step 4. Layer in furniture and a plush rug. I brought in a high boy dresser with a mirror, which I already had. Not only is this great storage for an already small closet, it’s a place for me to put on make-up without hogging the only bathroom in the house. Because I don’t have a lot of clothes, I don’t need additional closet space and opted for a small sofa so I could have a place to sit and put on shoes or throw clothes when I’m taking them off. The little sofa does all of these things and is a nice place to relax and read in my free time. The rug is plush and fem and not normally my style but because it’s my closet, it works. I choose something very plush because I won’t always have on shoes and it feels great underfoot. I used a thick rug pad to keep it from sliding and add another level of softness. This has also become a place to stretch, do yoga and Tracy Anderson videos, because why not? There’s a huge mirror and a big soft rug, It’s perfect for lightly working out when it’s a little too wet for me to run outside. 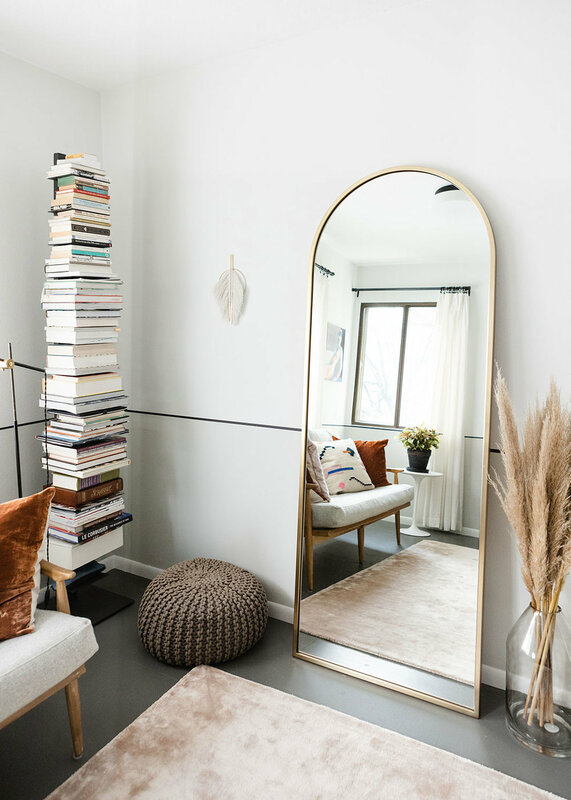 While smaller mirrors are ok, a floor length mirror will make a dressing room work for you. 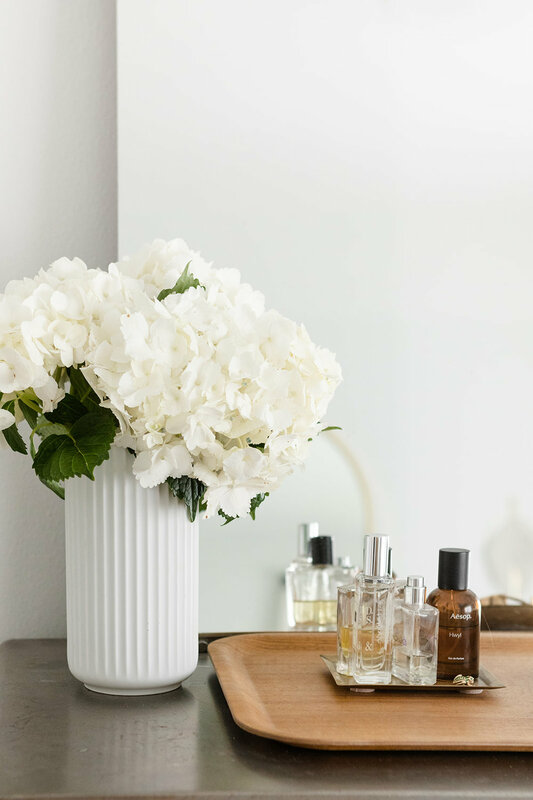 You’ll be able to see your entire look and if you find something special, it will add a beautiful layer to your room.